This location and views are hard to beat! It's only steps to the white sand beach that stretches uninterrupted, except for Crystal Pier, for 3.5 miles. A variety of shops and wonderful restaurants are just a short stroll away down the lovely Boardwalk. Enjoy stunning views from this light and airy 3rd floor corner ocean view condo. 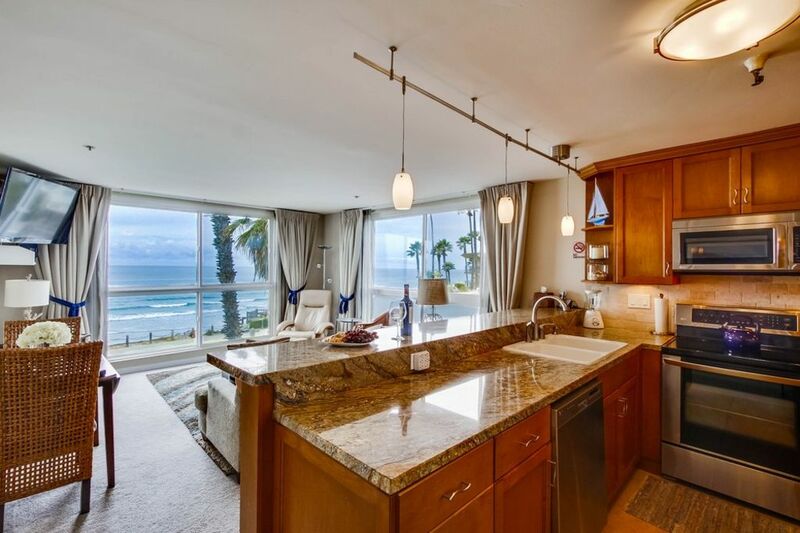 Take in the gorgeous sunsets from the west windows that overlook the ocean, beach and Boardwalk and don't forget the view you will see through the north windows of the hills of La Jolla. This beautiful condo has been recently updated and everything is top quality. Fully equipped kitchen has hardwood cabinets, granite countertops, stainless steel appliances, and tile floors in kitchen, bath and entry. All new furniture includes a king size bed, a queen bed with a single pull out trundle bed, and a sofabed with a memory foam mattress. Cable TV, Cable internet with WiFi and free unlimited nationwide calling. Beach chairs and towels, beach umbrella and boogie boards.There is a large coin op laundry room where you can do all your laundry at once. Community pool and hot tub, lounging area, gas BBQ and underground parking for one vehicle. Building is locked and requires a key for entry. Location is 2 miles from SeaWorld, 3 miles from Old Town, and just 7-9 miles from the Gas Lamp District, Little Italy, the Embarcadero with it's floating museums and the world famous San Diego Zoo in lovely Balboa Park. Within two hours drive is DisneyLand, the Wild Animal Park, the historic gold rush town of Julian, and Anza Borrego Desert State Park. Come enjoy all San Diego has to offer along with the best weather in the nation! ASK us if this unit has AC! * Ocean view from livingroom.diining and kitchen. We live in Wisconsin and our son goes to college in San Diego. The ocean view, smells and sounds of the ocean and being so close to so many great restaurants that you can walk to. Watching the sunset from inside the condo or out on the beach. Riding bikes along the 7 mile oceanfront boardwalk (round trip) and/or around 4000 acre Mission Bay Park. Underground garage - height limit 6'. A comfortable property , brilliant views and in a brilliant location in Pacific Beach. Great place, would stay here again. Great location, on the beach, close to attractions, clean condo, comfy beds, nice amenities. overall experience was nice. Condo was clean and just the right size for our family. Location was great as well. The fact that there wasn’t a balcony it made it hard to go to the beach and bring back the kids toys with sand and wet towels. Everything had to kept in the middle of the apartment. Overall not a bad apartment just wouldn’t recommend it for a stay longer than a weekend. Thanks for your feedback Alexandre. We do not advertise this property as having a balcony. Our apologies that you had troubles rinsing and drying your beach accessories. We provide beach chairs, umbrella, a cooler, beach toys, beach towels and 2 beach cruisers for our guests to enjoy. There is a hose to rinse your items on the ground level by the pool. I suggest you rent a house next time you stay at the beach. Gorgeous ocean view and well-appointed unit! Our vacation at Pacific Beach was terrific with great weather, beautiful views from the condo, comfortable beds and a well-appointed kitchen. The condo did not disappoint and was all and more it was adverttised to be. We enjoyed our time at the beach, pool, San Diego Zoo, Sea World, Balboa Park, the Old Globe Theater, Point Loma Seafood and more. We hope to be back next summer! Thanks for your feedback. We are thrilled you enjoyed your stay. Great location, Great condo, Great vacation spot! Newly remolded condo and everything was perfect! Looks exactly like the pictures. Beautiful two large windows overlooking the ocean that give you extra viewing, you can watch the surfers day and night. Great location to walk to restaurants and along the board walk. Small enough condo facility so that everything was close- garage, pool, and apartment.